Mr. Gasket 1526 Mr Gasket Braided Fuel Line Kit - 3 ft.
Mr Gasket Braided Fuel Line Kit - 3 ft. This universal braided fuel line kit is 3/8 inch by 3 ft in length. This universal fuel line will fit on any standard 3/8 inch hose barb in any fuel system. Sized at 3/8" ID x 3ft, comes in handy just about anywhere fuel line is needed. Universal in design and very flexible, this fuel line can be used anywhere! Works great as transfer line from your hard fuel line to fuel pump or from pump up to the fuel filter or carburetor. 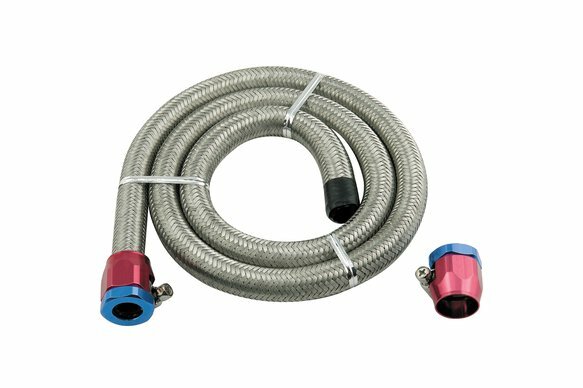 3 ft fuel line features a flexible rubber 3/8" ID hose, covered with a steel braided jacket with bright anodized red & blue clamp covers on each end. This hose section of 36" can be cut to any size needed & works on all gasoline applications, such as lawn mowers, tractors, go carts, snow blowers, motorcycles, cars & trucks.